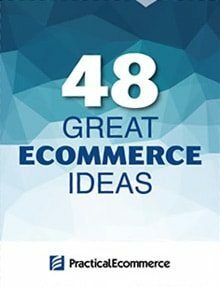 Ecommerce is growing every year. But mobile ecommerce — purchases from smartphones and tablets — is growing even faster. One of the key points merchants must understand when building mobile commerce sites is that shopping habits of mobile shoppers are different from shoppers using laptops or desktops. In this article, I’ll review the principal shopping differences of mobile users, to help merchants develop their mobile commerce strategies. There are several reasons why mobile users convert less compared to desktop users. These include screen size, performance of the mobile device, and location of the shopper, among other reasons. As a shop owner, understand that visitors will convert to customers less on a mobile device than on a desktop computer. 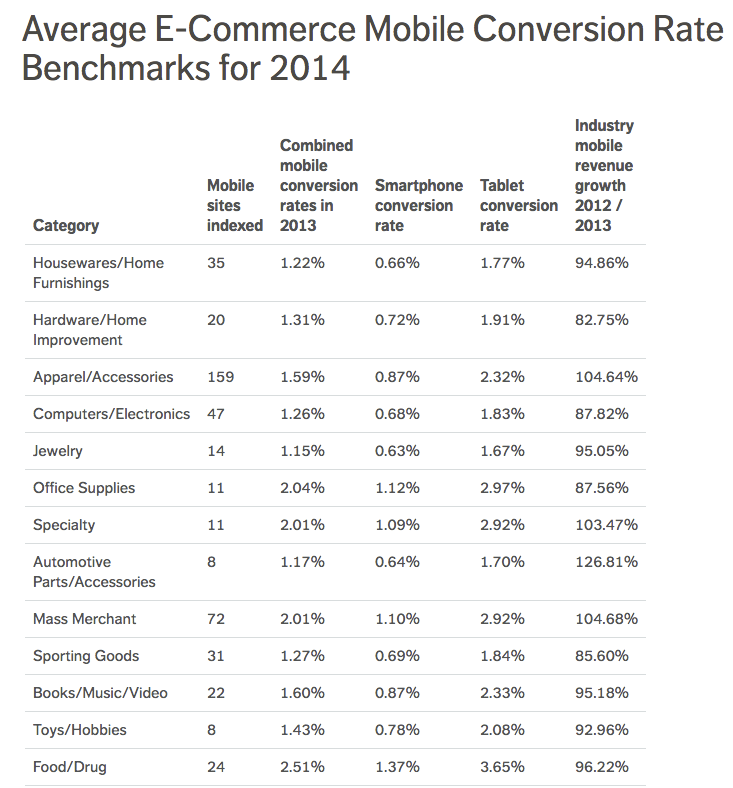 Mobify, the mobile commerce platform, assembled the following mobile conversion statistics for 2014. 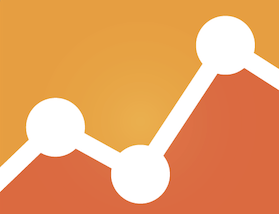 Mobify analyzed mobile conversion statistics in 13 industry categories. Conversions from smartphones ranged from .63 percent to 1.37 percent. Conversions from tablets were higher, ranging from 1.67 percent to 3.65 percent. How likely users are to purchase on mobile depends on the industry. Mobile conversion rates range from 1.15 percent in the jewelry industry to 2.51 percent in the food and drug industry, according to Mobify. 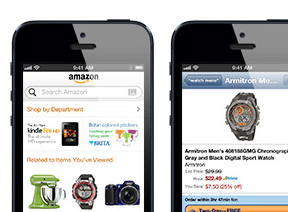 Mobile visitors are apparently more comfortable making smaller purchases versus larger ones. Across many categories, smartphone conversions are significantly lower than tablets and desktops. By and large, conversion rates are below 1 percent on smartphones while rates in the same industry are typical 2 to 3 percent or higher for tablets and desktops. Many shoppers use their smartphone for the initial research phase and continue the process on other devices. When building the smartphone ecommerce experience, focus on the most important information; make the buying process as streamlined as possible. Smartphone processing power is usually weaker than tablets and desktops. Slower load times can reduce smartphone conversions. Tablet conversion rates are often much higher than smartphones. This is despite the fact that many sites are not specifically optimized for tablets. The tablet’s larger screen size influences conversion rates. Most sites are not optimized for anything but desktop and tablets have a close experience because of screen size. Thus tablets are a bit of a hybrid between desktops and smartphones. Although smaller on average than desktops, the tablets’ larger screen sizes allow for more information and elements to be included on the page. Tighten up the tablet experience and the conversion rates could improve. Visitors often use a combination of devices throughout the purchase journey. Instead of starting and ending the shopping process on one device in one session, often there are multiple sessions and devices. If conversion rates on smartphones are lower than 1 percent, it could be because visitors are switching to desktop or laptop computers to make the final purchase. But, importantly, understand when and why customers are moving between devices. Is it a natural movement, or is it something that needs to be refined? It’s worth digging into the analytics on those customers that purchase on mobile to understand their demographics and reasons to purchase — to better serve this segment. Additionally, make sure your website experience is consistent across all devices to eliminate confusion. Smartphone and tablet visitors do not typically have physical keyboards. This presents a challenge to them during the checkout process, with the many steps and form fields. Moreover, on-screen keyboards reduce the already limited screen space on tablets and phones. And the weaker processing power of mobile devices means slower response times during checkout, which leads to abandoned carts. Keep the checkout process simple and streamlined. Test the process across many smartphone and tablet devices. Part of the reason mobile conversion rates are less that desktops and laptops could be due to technical problems in the mobile experience. In many cases, a mobile visitor is ready to make the purchase, but the experience does not support it. Additionally, consumers may expect a frustrating mobile experience and, therefore, they do not attempt to complete the checkout on a smartphone or tablet. In short, test your site’s checkout process across many devices and browsers to reduce technical limitations.